Recently a subscriber asked me to show you guys what makeup I wear to the gym, I usually try to avoid wearing makeup at the gym because your skin needs that time to breathe, but when I have things to do right after the gym with no time to do my makeup I have a quick go to look that doesn’t clog your pores and doesn’t have a heavy “painted on” look to it. I always start off with a BB Cream as foundation can clog the pores, as well as cake up around your eyes and nose, So I use the Garnier BB Cream in Light/Medium and apply with a Real Techniques Buffing Brush. Then Skipping powder (it turns into a total mess when sweating), I jump straight into the brows, I’m using the Sleek Au Natural Palette and using the shade Bark and a MAC 266 brush I fill in my brows, but I don’t do much shaping as I want to look as natural as possible. Then using the same sleek palette I use the color Nugget and go all over my lid up to the brow bone using a Real Techniques base shadow brush. Then using the same brush I use the color Cappuccino and apply to the lid up into the crease. Then using the Maybelline Liquid Line Stileto in Brownish Black and line my upper lash line, really tightly against the lashes. Then going back into that Bark color with a Sephora smudging brush, I go underneath my waterline against my bottom lashes and slightly smudge up in the outer corners. I then use the Almay Dial up One Coat Mascara in black (no longer available) I apply lightly to my upper lashes. I finish with the Sleek Pout Polish in Electro Peach. And now I’m ready to go workout. 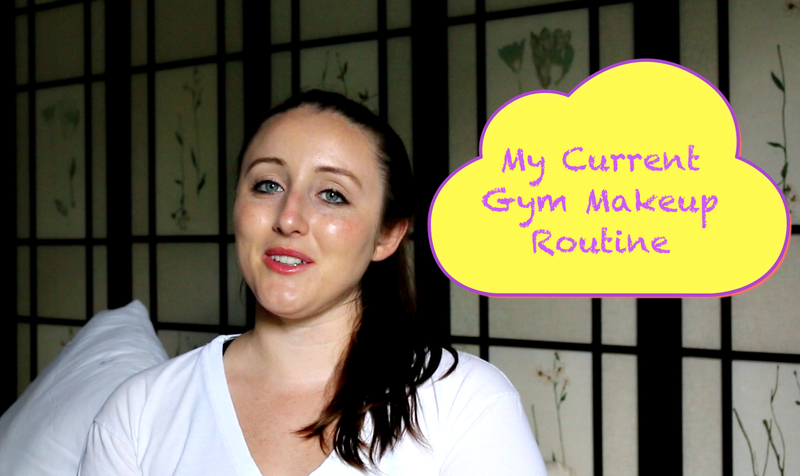 You can see my full Gym Makeup Routine video below….